I love good kitchen gadget. However, as part of my minimalist streak I have streamlined my kitchen. There are still a few gadgets I cannot live without. Today I’m going to wax poetic about my food processor and handheld immersion blender. First, the food processor. It took me a looooooong time to decide to buy a food processor. I felt that a sharp knife and good knife skills could carry me through any slicing and dicing that was needed in the kitchen. No need to clutter my counter with a bulky machine I would use rarely. I finally succumbed a few months ago after going paleo and wanting to make cauliflower rice. I used it a few times and hated cleaning it (I was washing my dishes by hand then). I recently started using the dishwasher (my husband convinced me it uses less water than handwashing) and now I love my food processor. Today I used it to shred brussel sprouts and butternut squash. Yesterday I used it to make 3 family-sized portions of cauliflower rice (I cooked with one and froze the other two). Tomorrow I may…who knows, but it will rock. The brussel sprouts came from our garden and were excellent. I put a frying pan over medium heat and added the bacon grease, garlic, and bell pepper. Once the garlic and bell pepper started sizzling I stirred until softened. I then added the brussel sprouts that I had easily and quickly shredded in the food processor. 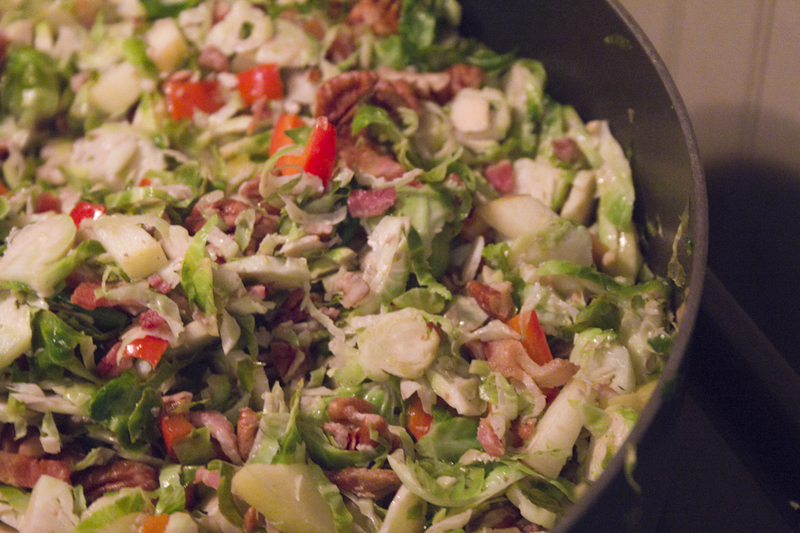 Once the brussel sprouts brightened up I added the apple, bacon, and pecans and heated for a few more minutes. I added a splash of lemon juice at the end. Voila. Superquick and supereasy and superyummy! 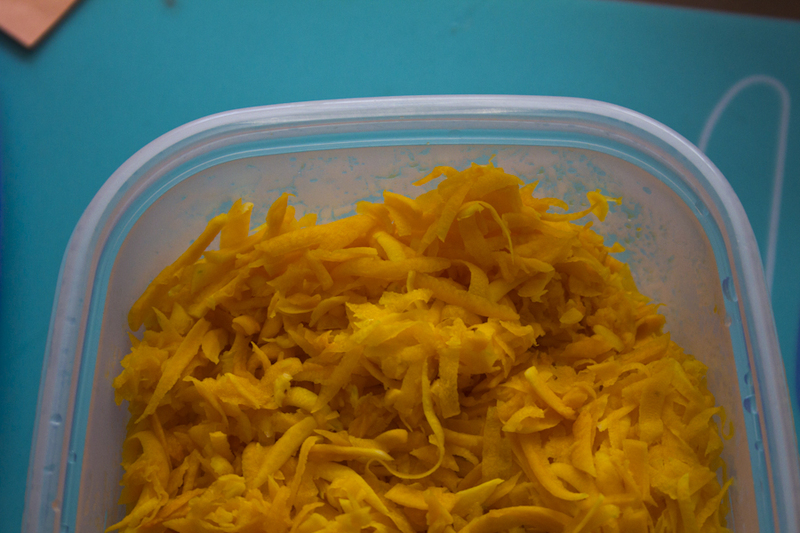 Tomorrow I will figure out what to do with the squash – I love that it looks like cheddar cheese shreds! Then came the really amazing part of the day. I made mayo!!! Paleo compliant mayo! I’ve read about making mayo but it has always sounded so intense and easy to mess up. Today was the first day of my Whole30 challenge – and in two weeks I start a paleo challenge with my box, Crossfit Thunder. And I’ve been living off chicken salad for a while now (it’s my go-to lunch staple). I was not about to let something like mayo keep me from doing this challenges. 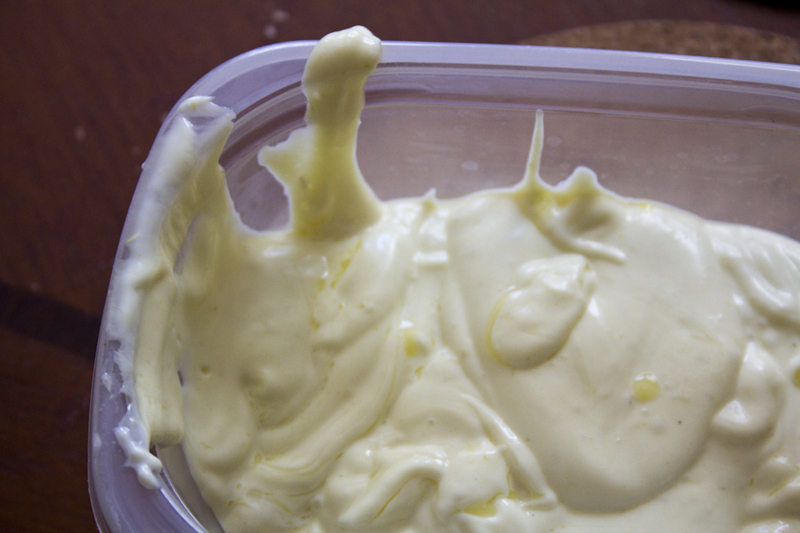 A google search finally led me to the perfect mayo recipe for me – the 2-minute mayo! Check it out at Serious Eats – there’s even a video to document the amazingness! Here is my mayo. I used a (not virgin) olive oil. Apparently the virgin olive oil can turn bitter – something to do with the speed of the blender. I also used the whole egg not just the yolk as it was just not coming together. Apparently the trick is to use a very narrow container so that the mayo-to-be is in a little tornado that allows the oil to be incorporated in at the proper rate. And I had paleo chicken salad for lunch! Awe, thank you! I appreciate that! I’ll get a post up tonight! I make my mayo in the blender and mix 1/2 walnut oil with 1/2 either mild olive oil or a cold pressed (but untoasted) sesame oil or canola oil) I love walnut oil in my mayo. Walnut oil sounds yummy! I was eyeing some macadamia oil, but the price was more than I was willing to spend.